Last week while everyone (myself included) was focusing on Citrix Summit 2016, the company quietly laid off their enter Sydney-based Citrix Labs group. The team in Syndey was made up of some very experienced people. Last week while everyone (myself included) was focusing on Citrix Summit 2016, the company quietly laid off their enter Sydney-based Citrix Labs group. The team in Syndey was made up of some very experienced people. The core group had an average tenure of 15 years at Citrix and was responsible for over 30 patents. 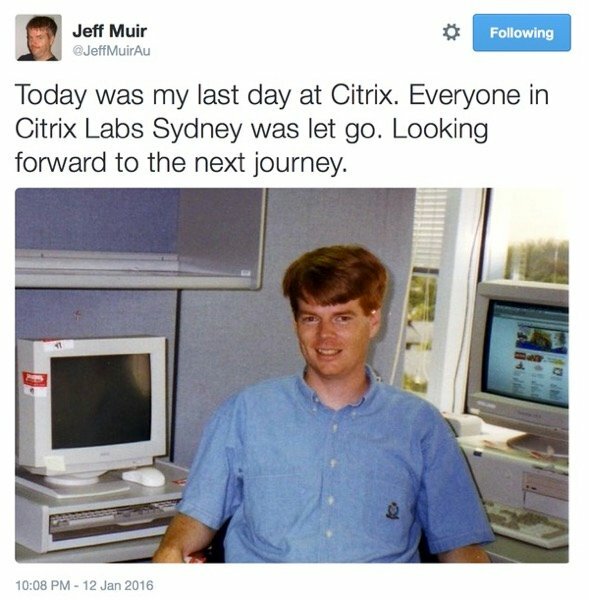 Here’s a photo tweeted by Jeff Muir of his early days at Citrix. He first started at the company in 1993. Think about that. Ninety-freaking-three!!! That group was lead by Martin Duursma, a guy who literally worked at the company longer than the company existed! (Martin was director of engineering at Datapac where he started in 1988. Datapac OEM’ed Citrix products and was behind the development of seamless windows, ultimately leading Citrix to acquire them in 1997. In 2006, Martin wrote about the Australian Research Center: "The Centre, which employs 30 engineers, is considered to be the innovation engine of Citrix’s product range. Its mission is to investigate technologies that are two to three years ahead of the current engineering cycle. This entails but is not limited to the investigation and examination of emerging concepts and technologies and also involves monitoring and providing input into industry standards bodies. The Centre’s mission is to develop the sophistication and value of Citrix’s product range and, in turn, deliver an enhanced experience for our customers." 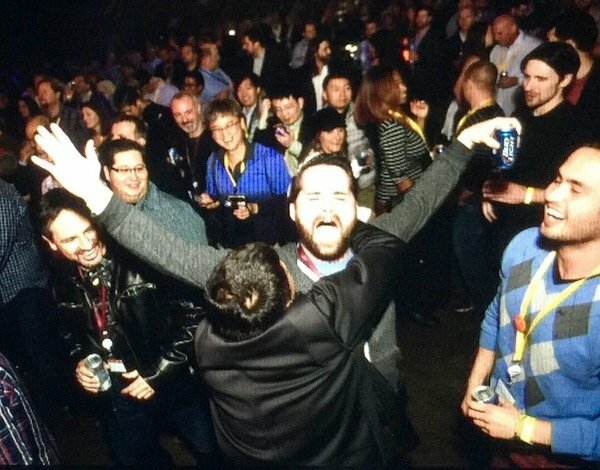 Everyone I spoke to said they loved their time and Citrix and that it was a great company to work for. (Actually, literally everyone said that, almost word-for-word identically. It was kind of weird.) But when pressed, it’s clear that this move was unexpected, that they feel this was a short-sighted cost-cutting measure, and that this never would have happened if Mark was still around. As one of the laid-off members wrote, "This team is one of the core innovation engines in the company but has been let go due to a spreadsheet exercise in cost cutting—IMHO a most short sighted decision whose deep impact will become self evident." Another person wrote, "So, if I understand this correctly, the Citrix message is something like, 'We are going to focus back on core.' And I'm thinking, 'Hey look, all these Australian blokes know the core better than anyone and actually invented parts of the core.' Now, I'm left scratching my head." And another: "It's a company that hired the best software developers around the world in the past. This move to consolidate to major existing development geos is an interesting strategy and only time will tell how it works out." There’s a saying about how someone else’s pork is your just cause, so it’s somewhat odd for me to support Citrix refocusing on their core (which will inevitably lead to cuts) while getting bent out of shape about 30 guys half a world away. But it really seems to me that the Sydney Citrix Labs team was a critical part of that core, and this doesn’t seem like it was a good move. I guess that 2-3 years ahead of a 1-2 year engineering cycle is less important for a company looking to sell itself right now. @Dan you hit the nail on the head. Even if they don't sell, the new CEO Kirill will want to refocus anyway, and this team was a nice to have. That said really cool to see Brian post an article about them. Thank you for all your contribution, hope you all end up in a good home. Thanks for writing this piece. It's always good to remember those who forged a way and innovated tech that we have all benefited from years later. To the lives and families of those affected, you will be remembered! Time to conquer the next great adventure. "We believe that Citrix can achieve a stock price of $90 â $100+ per share by the end of 2016. " Well, sales and marketing have been slashed, VDI-in-a-Box has gone and GoTo is going (there may have been others that I have missed), and now Citrix has cut some of the best and brightest. Meanwhile, the stock price which was $65 on June 9 is now a stratospheric $68. It's not gonna help the fact that stocks have lost more than 5% value since the start of 16' and will be in a Bears Market. While this is a correction, a necessary one. What better timing for Citrix to try to streamline itself. I hate to say it but over the years Citrix has grown too big for it's own good and that they were better off going private and not having to answer to Wall Street. Even Apple that is raking in Billions in a quarter is taking a beating by Wall Street.